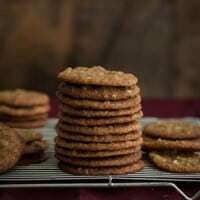 I’m popping in today to share a cookie recipe that I recently wrote as a guest post for the Food & Wine blog. It’s easy to get inundated with cookies and sweets this time of a year, but I couldn’t help but sharing this recipe. My family has quite a few cookie recipes up our sleeves but this gem comes from my grandmother. These are my, “I need cookies and I need them quick” cookies. I usually have everything I need on hand and they whip together and bake up quick. 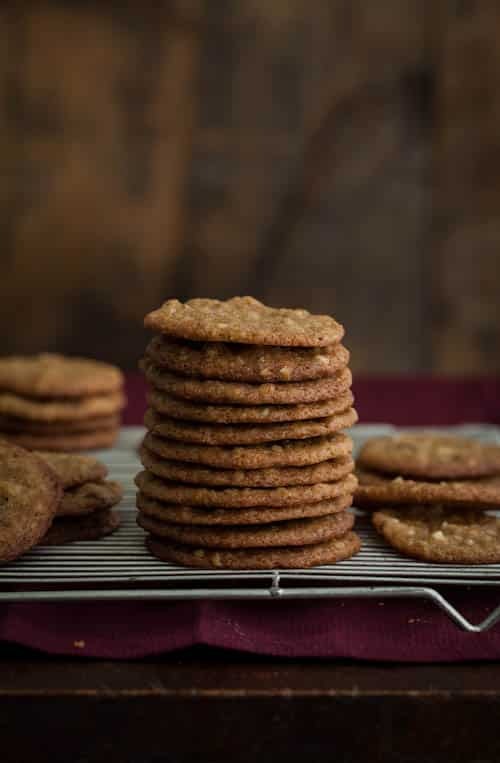 These cookies have the perfect buttery-pecan flavor with a bit of crispiness (these are, hands down, my favorite cookie to dunk in a cup of coffee.) So, if you’re looking for a lovely addition to your cookie collection, these are it. Preheat oven to 400˚; line a baking sheet with parchment paper. In the bowl of an electric stand mixer, combine the softened butter with the brown sugar and beat on low until combined. Add the egg and vanilla, and beat on medium speed until the mixture has lightened in color and is fluffy. Turn the mixer back to low and add the flour, baking powder and salt. Once the mixture is well combined, add pecan meal and beat until just mixed. Place 2 teaspoon-size scoops of the dough onto the sheet, spaced 2 inches apart (roughly 12 per tray). Bake for 7 minutes, until the cookies are a golden and have spread out. Remove from oven, let cool for 10 minutes, then transfer to a rack to finish cooling. Store in an airtight container for 4 to 5 days or freeze for up to 2 months. • Older cookie sheets work better, as the newer, insulated ones don’t crisp the cookies as well. 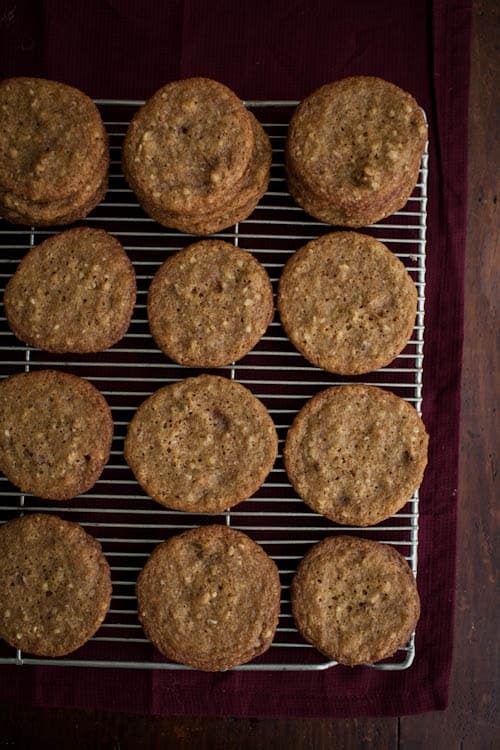 • I’ve chosen to bake with parchment paper, but these cookies can also be baked on an ungreased cookie sheet. • Grind unroasted, unsalted pecans into meal if desired. I invite these cookies into my mouth, they look beautiful and so rich! They look really crispy in this picture. Do they have any ‘chew’ to them or are they all crispy? They do have a bit of chew to them- they aren’t 100% crispy cookies. Mmm! Love melt in you mouth cookies. These look awesome! I’m totally fine with becoming inundated with cookies at this time of year. These look fabulous! I wonder if I could substitute the egg with Flax or Chia? The flavors sound great! Wonderful blog you have here! I always love adding an “all ingredients on hand” recipe to my collection for those nights you just need some cookies – fast! These look great and similar to my go to of chocolate chip cookie batter (sans chocolate chips) with chopped and whole pecans! I’m excited to try it with a pecan meal though! These turned out absolutely amazing. Thank you for such a fabulous recipe. 1/2 cup butter = 226g, 90g for the flour, 50g for the pecan meal, and 192g for the brown sugar. Hope that helps! Will this recipe work in high altitude? I’m in Colorado. I’m sorry I’ve never tried it at high altitude but I think you could adjust it to work.